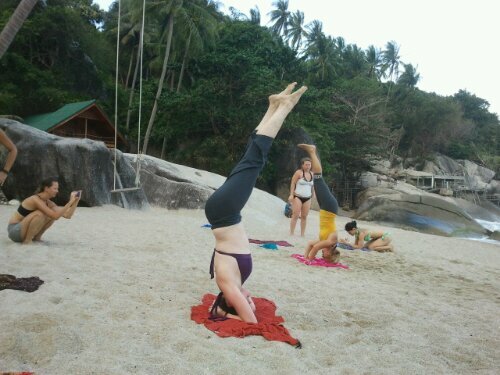 I have left Koh Pangnan island in Thailand full of yoga and ready to keep traveling. Next stop is Loas to celebrate being a fully certified yoga teacher. Getting off the island is harder then I realized. We are taking a truck out of Haad Tien beach, than a boat to Koh Samui, followed by a flight to Bangkok and then a train to Laos. Fun day. Lots of traveling!!! Now that this course is over, I found at the end of this time I understood more about yoga then ever before (which I expected). I also understand how much more I still need to learn. This samething happened to me after taking the Aubre Hill workshops. It is true wisdom to understand your ignorance on a subject and grasp the idea for the journey. With yoga and belly dance knowledge is a life long journey…I am ready to start!